The Renegade Money Guide 2.0 is a compilation of unique ‘Money Hacks’ like no other. It comes complete with its own online private member dashboard. Think of RMG as your short-cut straight to financial acceleration. Dozens of actionable tips, tricks underground wealth-building ideas. Cash-saving loopholes normally unavailable to most people. A coveted resource / coach, one we’ve known for years, that helps people become mortgage-free in record time. We’re so confident you’ll find value in this premium report that we’re offering a 100% money-back guarantee. Your purchase is fully guaranteed for up to 60 days. If you’re not 100% satisfied with any of these reports, M4 Research, LLC will refund your money completely once you submit your request to our support desk. Not applicable. This is a one-time purchase. What is the difference between The Renegade Money Guide and M4 Insider? M4 Insider (M4i) is our flagship subscription-based product — it’s a full-blown private wealth-building membership club. M4i members have access to the most cutting edge active & passive money-growing vehicles and strategies as we uncover them. Plus, the M4i Journal archives over five years worth of information on wealth-acceleration, cash-flow generation, passive-income steams, managed trading accounts, insider investing, credit funding and much more. 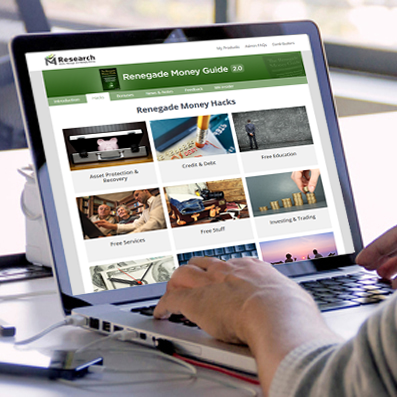 You can look at the Renegade Money Guide (RMG) as a very scaled-down sister site to M4i. RMG is a one-time investment. You get lifetime access to the current ‘Money Hacks’ we have listed (over 40). For less than the cost of four large pizzas, you’ll instantly get access to dozens of virtually unknown, yet highly actionable cash-boosting tips, tricks, and underground money-saving loopholes, all designed to fatten your wallet and save you thousands of dollars on fees, taxes, travel expenses, and more. Once you’re a Renegade Money Guide customer, you can use the ‘M4 Insider’ link inside your RMG member area to upgrade to M4i anytime you wish.